GlowHost Lamborghini @ HostingCon: Behind The Scenes! We all miss the HostingCon that took place in Miami. It was super fun! GlowHost offered a free Lamborghini taxi service service for our VIP clients and pals alike. Let me tell ya, there’s truly nothing quite like rolling downtown Miami in a Lamborghini Aventador with your company’s name emblazoned all over it. The funny thing is, a lot of people compliment me on how realistic the “photoshop” job on the car looks. “It’s almost like real” they say. When I try to convince them it actually is real, I usually have to back it up and send them this post to prove it. So now it is time to share the process of how we transformed a rather dull orange Lamborghini Aventador into a fully customized and beautifully exotic GlowHost whip. This entry was posted in Glow Goodness, GlowHost In Person and tagged Aventador, hosting, HostingCon, Lamborghini, Miami on November 20, 2014 by Matt Lundstrom. Receive the VIP treatment between the HostingCon hotel, events & parties. 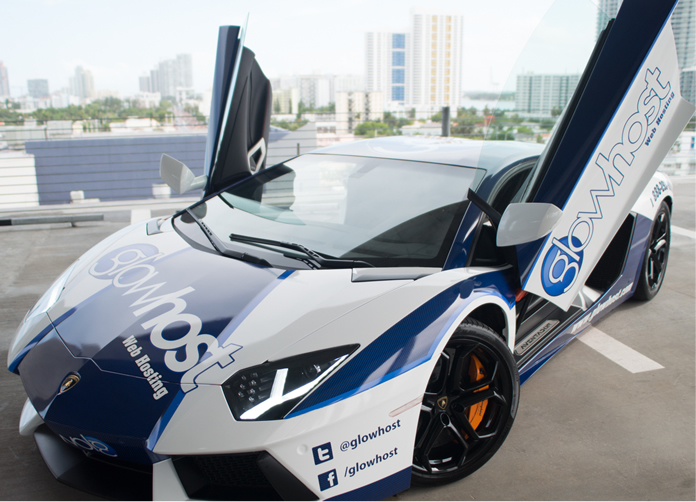 STUART, FLORIDA, June 5th, 2014 – Innovative hosting provider GlowHost (www.GlowHost.com) announced today attendees to the 10th annual HostingCon in Miami June 16-18 can now secure Free VIP Taxi rides in a Lamborghini Aventador. HostingCon is the premier industry conference and trade show for hosting and cloud providers. Each year it brings together the web hosting industries best and most important people for three days of training, networking and good times. This entry was posted in GlowHost In Person, GlowHost News, Social Media on June 6, 2014 by Daniel McCall.